So yes, this build was done today at 8am ! I don't think I covered this before. The info on any plsql gives you actual useful stuff. It prints out a stub of pl/sql that can be copy and pasted to get going much quicker than looking at a describe tabular output of args. I'll pick on dbms_metadata which is a huge package. This can still be way too much 'info' if the packages are very large. The other part of info is that you can get a subset. Here the ".a" was added to filter it down. 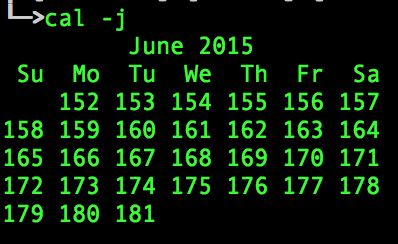 I'll blog more on why I'm showing metadata as there's some pretty interesting usages that I just found how to use. Not much to see here. Just looks like it should. Much like the info/info+ we added lots more. Just scroll over this or try it out and see how much more is there. It should give you just about anything you may be interested in. 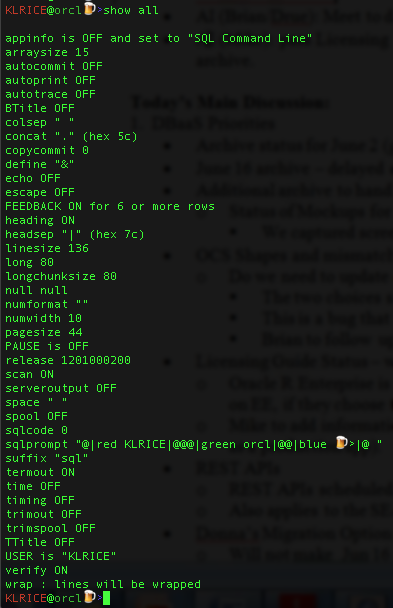 appinfo is OFF and set to "SQL Command Line"
sqlprompt "@|red KLRICE|@@@|green orcl|@@|blue 🍺 >|@ "
url top_base_url ""    base_url ""    node_url (Parent) "file:/Users/klrice/workspace/raptor_common"